Opilio parietinus is widespread across England and Wales but with relatively few records in Scotland. This species is undoubtedly benefiting from a warming climate in the north and is probably also being regularly introduced to new locations by human activities. The first British record in the HRS is given as 1878 in Dorset. However it is probably an introduction perhaps originating in the Caucasus/Asia Minor. It is readily transported with human cargoes and has spread widely across the world. A specimen turned up on a gravel road in the Falkland Islands in 2012 (A. Lavery, pers.comm.). This large, long legged species is very commonly found associated with human activities, on buildings and walls in towns and cities. Probably originally a species of rocky habitats in its home range, it has adapted to new opportunities in the disturbed and artificial environments provided by humans. It may benefit from the sheltered environment of urban areas to survive as it expands its range. It is found up to 125m in Britain and 1300m in the Alps (Martens 1978). 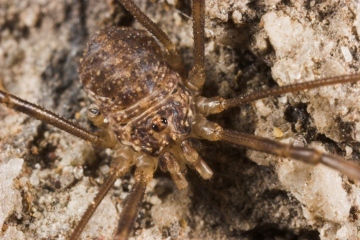 In the Netherlands, there is some evidence (Wijnhoven 2009) that this previously common species has been displaced by Opilio canestrinii, a recently introduced harvestman, and is now rare or extinct. So far this has not been detected in Britain. However, many of its pre-1992 location no longer appear to be occupied – perhaps because of an inability to establish viable populations or competition with other species (such as O. canestrinii) introduced to the urban environment. Adults are active from July to December, laying eggs in the autumn, which hatch around April/May. The young are found in leaf litter, under urban debris and in low vegetation. There is surprisingly little information on feeding in this species but food items include aphids, millipedes, spiders, dead vertebrates and pollen (Pinto-da-Rocha et al. 2007). There remains much to be found out about the ecology of this species in Britain e.g. what does it eat and is it losing out to O. canestrinii as the latter increases its range? Widespread and common, spreading northwards. Pinto-da-Rocha, R., Machado, G & Giribet, G. (eds) 2007. Harvestmen: the biology of Opiliones. Harvard University Press, Cambridge MA.